We now offer OTTO STEP! Safety for your dog as she travels in your SUV or Truck. 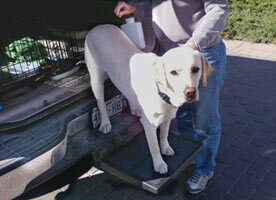 Check out OTTO STEP for your large or not so large dog! Easy access to your Van, SUV or Pick up truck! OTTO STEP Easily slips into your trailer hitch and makes an instant step making it easier and safer for your dog to enter and exit your vehicle.